Every day, cells in our bodies copy their DNA — about 6 billion “letters” worth — and divide. DNA replication is a fundamental process in biology, but it isn’t fully understood, said Brandt Eichman, Ph.D., associate professor of Biological Sciences and Biochemistry. And it doesn’t always proceed smoothly. DNA damage and other problems in the DNA template can make the replication “machinery” — the proteins that copy DNA — stall, leading to mutations and genetic changes that cause cancer and other diseases. 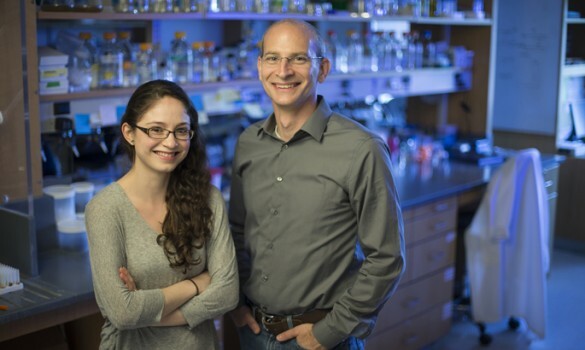 In collaboration with Karlene Cimprich, Ph.D., and her team at Stanford University, Eichman and graduate student Diana Chavez have discovered how the protein HLTF (helicase-like transcription factor) recognizes and remodels stalled replication “forks.” Their findings, reported in the June 18 issue of Molecular Cell, shed light on processes that help cells tolerate DNA damage and have implications for cancer therapies that target DNA replication and repair. Eichman has “always been fascinated by how proteins function as machines to manipulate DNA — how they recognize complex DNA structures like stalled forks and then remodel that DNA into new structures,” he said. This remodeling ensures that DNA is copied despite the presence of fork-stalling lesions, Eichman explained. HLTF is one of at least 10 proteins that recognize stalled replication forks and have a “motor” region that uses ATP energy to reverse the fork — to push it backward, zippering the unwound DNA strands back together. Andrew Kile, Ph.D., a postdoctoral fellow at Stanford, had demonstrated that HLTF binds to single-stranded DNA, and that it does this using a certain region of the protein called the HIRAN domain. The investigators used X-ray crystallography to determine the molecular structure — a 3-dimensional “picture” — of the HIRAN domain bound to single-stranded DNA. They discovered that the HIRAN domain binds to the end of a stretch of single-stranded DNA. During replication, such ends are part of newly synthesized DNA near the fork. “We figured out that not only does the HIRAN domain recognize single-stranded DNA, but it recognizes the 3´ (3 prime) end, a type of recognition that is fairly unique among single-stranded DNA binding proteins,” Eichman said. The team used this information to design biochemical experiments that demonstrated how the HIRAN domain enables HLTF recognition of stalled replication forks and promotes fork reversal in vitro and in cells. “Our study provides some of the first good evidence for how these fork remodeling proteins help stabilize stalled forks, using a combination of structural biology, cell biology and biochemistry,” Eichman said. It’s unclear why our cells have so many proteins to recognize and remodel stalled forks. Eichman and others postulate that stalled forks are not all structurally identical, so each of the fork-recognizing proteins is specialized for subtly different types of stalled forks. “Knowing this one little structure — one domain of one protein — gets us a bit closer to understanding how the whole protein works,” Eichman said. Understanding how cells tolerate and repair DNA damage has implications for cancer therapies, particularly for improving the efficacy of chemotherapies that work by damaging DNA, Eichman noted. HLTF and other proteins like it may also be targets themselves for new cancer therapies. HLTF is silenced in more than 40 percent of colon cancers, which could promote the accumulation of mutations and genome instability. Conversely, HLTF is amplified in many cancers, which might be advantageous to cancer cells that need to tolerate higher levels of DNA damage. Understanding the molecular details of HLTF’s interaction with DNA could aid structure-based drug design efforts. This research was supported by grants from the National Institutes of Health (ES016486, ES000267). Chavez entered graduate school at Vanderbilt through the IMSD (Initiative for Maximizing Student Diversity) program, which aims to increase the number of Ph.D. degrees awarded to graduate students underrepresented in biomedical research.